Strawberries and Cream Pound Cake! I heart it! Am I the only one who sees a “heart shape” in just about everything when it comes to Valentine’s Day? Everywhere I look I see hearts. It’s like those pictures where you stare long enough and you can see faces or animals or …er okay, maybe that’s just me. I find that happening around this time every year, love is in the air and hearts are on my mind! When I saw these gorgeous strawberries I immediately saw hearts, lots of pretty little strawberry hearts just waiting to be released from their strawberry confines. Do you see them? With a quick little trim and slice they make perfect little hearts that can be used to top so many different things! I knew they would be the perfect addition to my Strawberries and Cream Pound Cake. 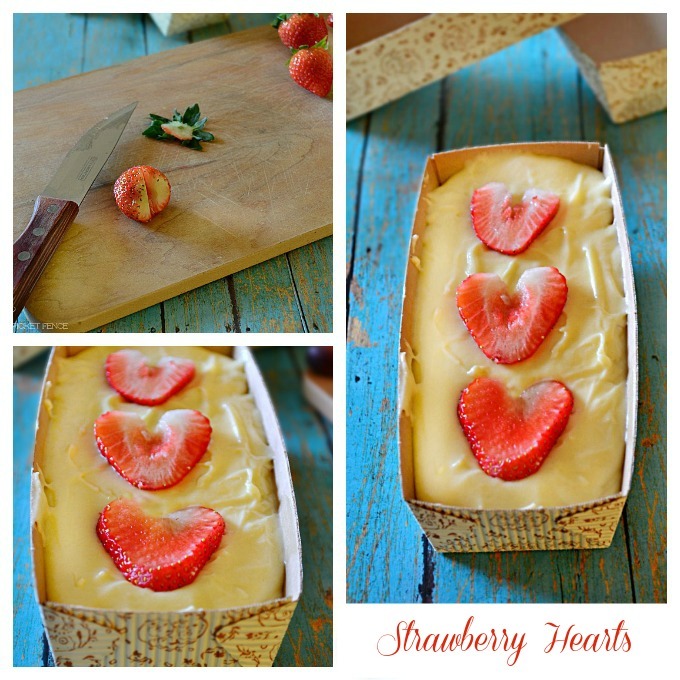 Sweet baked in little hearts as a fun surprise for this delicious dessert! Do you create a special Valentine’s Day dessert for your family? If not, maybe you’ll give this treat a try! Did you notice that fun printable recipe above? Now you can print our recipes straight from the blog! We hope you’ll enjoy this feature. Wish you could join me for a piece of pound cake and a cup of coffee! We could chat about love, and family and strawberry hearts! Like something chocolate-y? Here’s another great Valentine’s Day recipe, my Chocolate Nutella Lava Cakes! Thank you for joining me today! See you back here soon…at the picket fence! 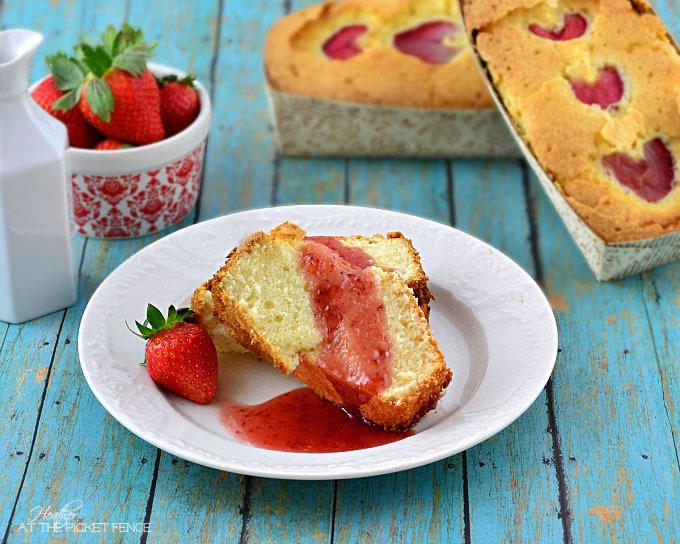 29 Comments on "Strawberries and Cream Pound Cake! I heart it!" Looks YUMMY and YES, I see hearts!!! Thanks so much for the recipe…can’t wait to try it! Oh these look so adorable and yummy too! Love the little strawberry hearts – how clever! Can I swing by your place for a coffee and a slice of this pound cake? 😉 My family will love this recipe! Pinned! YUM! What a delicious dessert or would be a great breakfast treat too!Beautiful photos! Oh my gosh that looks so GOOD!! Yes I can see the hearts, so cute! How cute with the strawberry hearts and it looks delicious, too! Gonna pin it! mmmm…that looks amazing! Thanks for sharing the recipe too. You are SUCH a rock star (and can you please insert about 50 million exclamation points here)! I LOVE it! Seriously! Those pictures are off-the-charts fabulous! Totally sharing anywhere in the universe….pinning….facebooking! From the stunning photography to the amazing recipe (homemade pound cakes beats the cardboard like store bought any day of the week), I am truly head over heels in love! I’m seeing hearts!! Yummmmmmmmm…This looks delicious AND beautiful. That new light kit… wow! Amazing photo, Heather! So what time would you like me to come over for some Coffee and Cake 🙂 This looks so YUMMY, Heather. Okay Heather, This is a MUST MAKE! 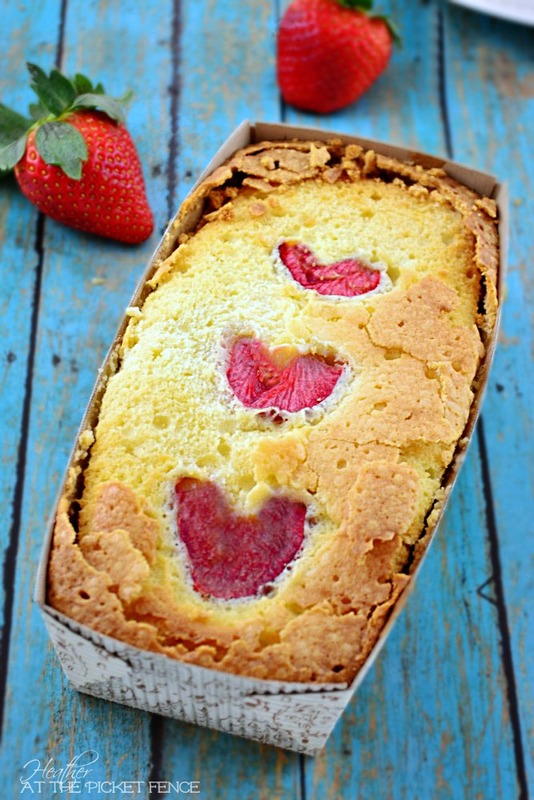 yep, I see strawberries as hearts this time of rear too:) This pound cake sounds sooooo good! YUM!!! This looks so good! Wow…looks fantastic and sounds so delicious!…Love the printable recipe!! Whoa – how incredibly scrumptious!! Looks de-lish! What a fun feature with the printable recipe too. Very cool!! Beautiful…making my mouth water. I love the way you have the recipe designed! Goodness … yup, pretty sure I just gained 5 lbs. by just *looking* at that! Yum! The hearts are too sweet peeking through. Thanks for sharing! OOh that looks absolutely delicious, I would love to share it in my weekly inspiration post and link back for your recipe and full post. Feel free Lee to link back to the recipe and post! Thanks!